A man has denied a charge of recklessly throwing a hamster in a cage out of a third floor window. Andrew Thompson, 20, of Oakfield Drive, Dumfries, will stand trial accused of throwing a number of items, including a television set and glass bottles. He pleaded not guilty to committing the offence at a flat in Oakfield Drive last October. He also denied assaulting a police officer by throwing a bottle at him. Trial will take place on 14 January. Mr Thomson denied culpably and recklessly throwing the items from the flat window. It is alleged they could have resulted in people being struck and injured. 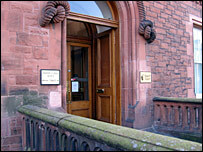 The trial will take place at Dumfries Sheriff Court.